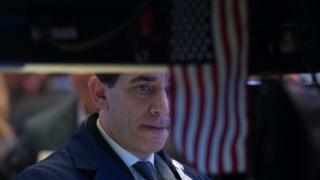 US markets have suffered a second day of steep losses, as investors dumped health care companies and Apple. The blue chip Dow Jones Industrial Average sank nearly 1.4%, marking its biggest one-day decline in months. The fall followed the news that Amazon, JPMorgan Chase and Berkshire Hathaway would create a new healthcare company with the aim of lowering health costs for their US employees. Bond yields also rose, reflecting last year's three US interest rate hikes. UnitedHealth Group and Pfizer were the two biggest losers on the Dow, while the insurance company Anthem saw the steepest losses on the S&P 500. Those are among the firms that would be threatened by the emergence of a major new competitor - or signs of a government crackdown on drug prices promised by US President Donald Trump. Apple dipped 0.6% on reports of weak demand for its latest iPhone, and energy firms also came under pressure. But the losses were widespread, touching nearly every sector. The Dow closed down 362.59 points at 26,076.89, while the wider S&P 500 fell 31.1 points or 1.09%. The tech-heavy Nasdaq shed 64 points or 0.86% to 7,402.48. Meanwhile, the closely watched Vix index, which measures volatility based on options prices, also shot up after months of calm, in what some investors say is a sign that more market fluctuation could be coming. The sell-off, volatility and rising bond yields mark a turn for US markets that have been making gains for months, racing past one milestone after another. All three major US indexes are up more than 5% since the start of this month. Eric Wiegand, senior portfolio manager at US Bank Private Wealth Management, said January's rise was driven by higher expectations, as global growth strengthened and the US approved major tax cuts. He said some investors were likely to be cashing in on their gains. They are also reacting to new information as companies update investors on their end of year earnings and provide forecasts for 2018. Others may be worried about the prospect of higher interest rates, which would drive bond yields higher. Bond yields have been relatively low in recent years, helping to make stocks the more attractive investment. But yields have gained more recently, as the US has raised interest rates. The yield on the 10-year Treasury closed on Tuesday at its highest level since 2014. "Investors are catching up to the fact that rates have risen," said Jonathan Mackay, investment strategist at Schroders. "The market's finally catching up." Investors are watching to see if the US Federal Reserve, which is in the middle of a two-day meeting in Washington, will signal when interest rates might rise again. The bank is about to undergo a change of leadership as Janet Yellen, who is viewed as favouring low interest rates, steps down.